All too often business owners find that unsatisfied customers will tell lots of people about the bad service that they experienced while a satisfied customer will tell only one or two people about the excellent service that they received. Unfortunately it takes a lot longer for a lawn care business to gain a good reputation than it does to get a bad one. If you are persistent though and offer a consistently high standard of service, a good reputation will come eventually. Customer service is crucial in the lawn care business as you are relying on long term, repeat business from your clients. 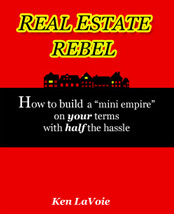 You are also relying on the word of mouth business that they may refer to you. Here are some tips for keeping your clients happy by offering a high standard of customer service. Make payment for your service as easy as possible. Chasing a customer for cash can get really annoying for both parties and damage a relationship. Before starting a lawn care business ask your bank what options are available. Having lawn service charges direct debited from customer accounts or setting up credit card payments can make things flow much easier. Customers always like to have a variety of options. As you will often be busy with noisy lawn care work or driving in your truck you may not be able to answer phone calls from clients or prospects. Consider having somebody handle your telephone enquiries instead of constantly having to tell people that you will call them back later. If you do decide to have customers leave a message then you should return their call within an hour. Don't neglect your online communication. If you do have a website and you receive enquiries via email make it a policy that you respond to them all within 24 hours. Make a point to have frequent communication with your customers to enhance your relationship with them. Send out a quarterly newsletter or post out cards at Christmas time thanking them for their business. Let them know that you appreciate their opinions by sending out a feedback form for them to complete every six or twelve months. Take the time to chat to your customers if they are home while you are working on their lawns. It only takes two or three minutes each visit to have a conversation that can help your relationship with them to grow. After a short length of time you can excuse yourself and tell them that you have to hurry off to your next job. Always try to over-deliver in terms of the quality of your service to the point where it doesn't cost you a lot of extra time. If you are able to exceed customer expectations and serve them well then they may reward you by spreading the word about your excellent service. Offer to help out with other simple jobs around the customer's property such as removing junk from their yard. This not only gets things out of your way for easier mowing access but you may be doing the customer a favor. Ask nicely if they would like you to remove it and dispose of it for them. Never give customers an excuse to terminate your account by inconveniencing them in any way. Make sure that you park your vehicle in a place that won't bother them or their neighbors. Always keep your equipment in tidy piles rather than leaving it scattered around the customer's yard. Every client will have different demands and it is your job to take the time to understand exactly what they want from you. Don't treat every lawn and every customer as the same. Keep a small file and note down each customer's preferences so that you don't forget. 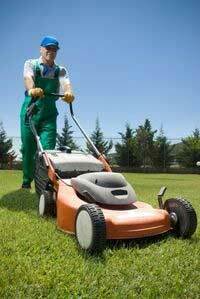 Having a uniform for your lawn care business presents an image of professionalism. If you and your employees are dressed neatly and conservatively then this will leave the best impression on the customer. A polo shirt, neat looking pants or shorts, work boots and socks are a basic requirement. Sleeveless shirts don't appeal to everyone and having employees take off their shirts, even on a hot day is generally not recommended for the image of a professional lawn care business. Providing a high level of customer service that is natural and honest is one of the best ways that you can maintain your customers and expand your lawn care business over the years. 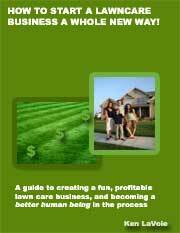 Successful lawn care marketing involves a plan for customer retention as well as customer acquisition.